» Rachael vs. 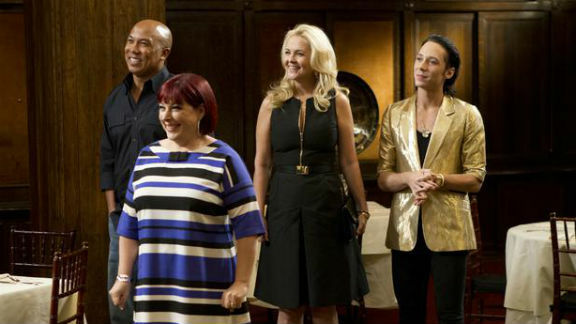 Guy: Celebrity Cook-Off Season 2: The World’s Greatest Cooking Show Returns! Rachael vs. Guy: Celebrity Cook-Off Season 2: The World’s Greatest Cooking Show Returns! Did anybody have a good 2012? I did not. I have polled a lot of people, or at least some people, and everyone I talked to agrees that 2012 belongs in the garbage bucket. My New Year’s resolution is to buy a garbage bucket. Even Obama, who in 2012 was a doctor office’s magazine’s Person of the Year and got himself re-elected most powerful person in the world, still has to go and be President for another four years, and frankly that seems miserable. He does not seem to be enjoying it one bit. The other person who maybe had an OK 2012 was that one gymnast girl, not the one who made a face, but the one who won more stuff. I’ve already forgotten her name, and the Olympics were not that long ago, so how great could her year have been? I’m looking back on the year because I realized a few weeks ago that my 2012 started off with watching and writing about Rachael vs. Guy: Celebrity Cook-Off for this very website, and I sort of blame that show for setting the tone for my year. If you did not watch it, I will recap for you: It was bad, and lots of people who were on it made me sad. Aaron Carter asked, “What about a macaroni salad?” and then tried to intuit ranch dressing via four of his five senses. 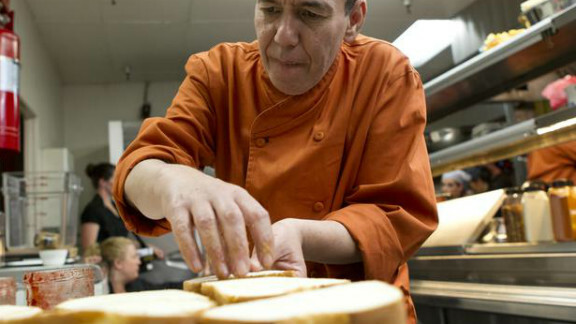 Coolio saw his dreams of culinary stardom dashed on the rocks, and Lou Diamond Phillips helped his charity. The end. At the time, no one would have dreamed of referring to those six episodes, aired clumsily over five weeks, as “Season 1.” That would unthinkably imply more seasons, in a way that a “witty” drunk television character might introduce someone as his “first wife” and everyone on the show (but not at home) would have a laugh about it. Yet here we are. It’s one year later, and Season 1 winner Lou Diamond Phillips has defied the odds and become the most successful restaurateur in the world with his finale-winning restaurant concept Blessings, still both a beautiful name and a beautiful sentiment. Guy and Rachael are back to shepherd eight celebrities with passing relationships to kitchens through a gauntlet of semi-public humiliations on the way to raising awareness for charities. I hope Guy Fieri and Rachael Ray had good 2012s. Guy opened a huge restaurant in Times Square, then a medium-funny New York Times restaurant critic was pointlessly mean about it in his newspaper, and then Guy got to do lots of press to explain why his food, which is universally understood to be gross, now tastes gross in a city important to bloggers. Meanwhile, his restaurant still does very well and that New York Times critic is back to writing non-viral restaurant reviews. I don’t know what Rachael has been up to, but probably writing books and going on talk shows and cashing checks. I did a Google News search for her name to check in on her year, and I got sidetracked reading about a former cheerleader turned MMA fighter named Rachael Wray. Food Network should consider giving this Rachael Wray a show; she seems great. I’ve only seen the first episode of Season 2, and our Rachael Ray did not “take the back” even once. (That’s a fighting term I learned from a friend. I’m more of a squash guy. But lots can happen over the course of a season.) They showed a preview for what’s in store for the season at the top of last night’s episode, and it was like a grab bag of my personal show-biz nightmares: Lou Diamond Phillips comes back to ham it up, and then both Kathy Griffin and Manny from Modern Family show up to just “own the room.” In the meantime, let’s deal with the premiere. Next up is Gilbert Gottfried, who seems like a nice, nervous man very out of his depth. He meets Chilli and their connection is so immediate and enduring it’s like they’ve been friends their whole life. Gilbert was Iago in Aladdin, so he gets a lifetime pass from me. Also, as everyone else is introduced, a few seconds of home video footage of them cooking in their kitchens is shown, to give the impression that they have cooked before. Nothing like that is shown for Gilbert. Through the course of the episode, it becomes unclear whether he’s ever eaten food, much less cooked it. Dean McDermott is an actor and a “hunk” and best known for his reality shows with his wife, Tori Spelling. I guess I had heard of him, but I’d never seen him talk before. He seems like a nice, large man. Also nice and less large is Carnie Wilson, of Wilson Phillips. She says, “What you don’t know is I’m a good cook.” Actually, Carnie, there is a ton I don’t know about you. But I do remember a friend telling me that on the recent TV Guide Network reality show about Wilson Phillips, Still Holding On, it was a major plot point that Carnie’s stomach surgery made it such that every time she took even one sip of water, she farted. It got to be a major problem. I hope it doesn’t cause drama on this show. I had heard of Hines Ward, former Super Bowl MVP, but had no idea he was on or won Dancing With the Stars. What I did know that a 2009 Sports Illustrated poll of NFL players voted him the dirtiest player in the league. He was famous for blocking players on their blind sides with his helmet, and after he broke a guy’s jaw and ended his season, the NFL created the Hines Ward Rule to ban such hits. I’m excited to see how he operates in the kitchen. He is going to rip Gilbert a new laugh hole. Ideally he’ll be gentler with Cornelia Guest, who is a “socialite.” I’ve long been a Cornelia Guest fan, so this is going to be so fun. (I’m just kidding, who is this person?) I get that “socialite” is a silly, vague thing, but they don’t even bother to say why she’s a “socialite,” like who her family is or who she married or blew on camera or anything relevant. They show a black-and-white photo of her walking with Sylvester Stallone from 25 years ago, as if that is proof enough. In the 1980s, it was a gigantic deal to wear a dress near Mr. Rocky Rambo himself. Cornelia proudly declares that she will be cooking only vegetarian food, and she’ll have a partner/nemesis in Kathy Najimy, of film and television fame. I don’t know that I’ve actually seen Ms. Najimy in anything lately, but she is the sort of actress who did the kind of projects people of my generation reference every six hours. Without exaggeration, I hear Hocus Pocus talked about twice a week. * Yesterday, I was walking by Madison Square Park here in New York, and a friend pointed at the Flatiron Building and said, “Wasn’t that Kathy Najimy lingerie show set there?” He meant Veronica’s Closet, and Kirstie Alley would be mad to hear it called Kathy’s show, but yes, yes it was, 13 years ago. Last, but certainly not least, entering in bedazzled slippers and bedazzled everything else, is figure-skating champion Johnny Weir. Mr. Weir seems otherworldly, and everyone sort of stares at him in wonder. He is very small and I think he has lip gloss everywhere; his skin is so nice he seems to actually glow. It’s kind of distracting. He promises the audience, “I won’t crumble under the pressure. I’ll rise like a Phoenix!” I think that means he has to burn to ash first, but who’s nitpicking? With our contestants introduced, it’s time to meet the real stars of the show, Rachael Ray and Guy Fieri. They slowly make their way down opposite stairways to greet the contestants. Dean says, “When they come out, now this is real.” I would disagree, Mr. Spelling. Real people do not wear plaid tuxedo jackets and back-of-head sunglasses at the same time. Mr. Fieri is presumably a very busy man, and I’m sure he always has a lot on his plate, so I’m so glad he did not forget to wear sunglasses on the back of his head, even though he’s in a tuxedo indoors. “Check.” That’s what he said after he put those on the back of his head. Before he left the house he was probably running around like a mad man looking for his sunglasses, and then his ex-stripper majordomo said, “Mr. Guy, have you checked the back of your head?” I don’t know for a fact that his house has a butler running it, but I imagine that if it does that butler is a lady who got glitter on Guy’s neck the first time they met. For the first challenge the teams will each be opening their own dinner theater. Guy very coyly points out the meaning of this: “Dinner … and theater.” All the puzzle pieces are falling into place. Each team member must make 100 tasting portions of their own recipe, and then the team will work together to make one dessert. The major catch/twist is that the guests at this party will be from Entertainment Weekly. Can you even imagine, having to serve food to people who work at a magazine? I’d be so nervous. The contestants should plate their food awkwardly in front of a blue background, which is a reference to how every Entertainment Weekly cover is an ugly posed photo of somebody from The Hunger Games or a vampire movie in front of a blue background. The contestants treat this news like they will be serving dinner to Nelson Mandela. I don’t know; maybe Entertainment Weekly is the Nelson Mandela of Hollywood. For the theater portion of the challenge, each team must put on a three-minute “skit.” As we in the business know, “skit” is a term that applies to very funny and enjoyable things, and not the sort of stuff an a cappella troupe does between show tunes. Hines can’t believe he’s being asked to act. This is the second reality competition show he’s done, and in the previous one he had to learn a new dance every week, and he is blown away he’s being asked to do a “skit.” “This is not what I signed up for,” he says. What exactly did you sign up for? I would like to see that contract, but it’s probably a bummer. The teams split off into their separate RVs — I don’t know why, but they are in trailers — to figure out their meal and skit. If one hopes that somebody mentions “macaroni” during every Rachael vs. Guy season premiere, Carnie delivers. “The first thing I think of is this amazing macaroni and cheese. The sort of macaroni you’d bring to a party.” Carnie should market a line of pastas with that as the slogan. “Carnironi: the sort of macaroni you’d bring to a party.” Their team’s theme will be a pot-luck party. Rachael tries to get a feel for what Gilbert wants to cook. He goes limp, like he was not aware he’d be asked to cook foods or name foods or answer questions or make eye contact with people. As she names things — eggs? — he sort of squints and smiles, like as long as he remains still and doesn’t say the N-word he can make it past this challenge. I am loving Gilbert on this show. I want him to say, “Ahhhh, I don’t really feel like cooking.” Eventually, she forces “PB&J” on him, and that seems to trigger some kind of childhood sense memory, and he agrees to make it. She tells him he’ll need to fancy it up, with cinnamon sugar or something. Yes, that is very fancy. He says, “Everybody is coming out with the most elaborate dishes!” Is he referring to the party-ready macaroni and cheese? Gilbert says, “If it’s horrible, I’ll throw all the blame on Rachael.” For their skit, Kathy Najimy came prepared with a telling of Cinderella she narrates backward, quickly and confusingly. Unless she’s some kind of Shine genius, she’s done this before, and she quickly casts all the parts. As their theme is “pot-luck party,” backward Cinderella is a natural fit. Over in the Guy trailer, Chef Fieri is puppet-mastering his wildest fantasies. “When I look at Dean, I immediately think SHERIFF.” Do you now? In Guy’s mind, the Old West was won by tall, tattooed Canadian actors with limited voice-over experience and a series credit from Northern Exposure. Dean is going to do some kind of beef over spicy polenta, and he’s got a confidence that is very Diamond Phillips—esque. In the spirit of the West, Hines is going to make Asian chicken wings. This was the dish he was making in his audition video. It’s a letdown when these contestants lead with the one thing they are good at cooking. Save it, guys. The first few challenges are just going to weed out the sub-verbal personalities, so you just need to sit still and not say the N-word to make it through. Their menus decided, the contestants head into the kitchens and apron-up. It is chaos, naturally. Chilli is grossed out by how much tilapia she has to season. These people have probably not cooked a dinner for 10 before, and if they have, the guests were most likely civilians. They can’t even fathom the amount of food needed to feed a hundred writers for ENTERTAINMENT WEEKLY. Your guests will know the birthday of every single celebrity in the world, so you best come correct. “Bring your A game” is on this week’s Must List. Kathy goes on and on about her vegetarian stuffed mushroom recipe. “I’m a season freak!” she yells, and I think Season of the Freak was a Nicholas Cage movie about wigs. Carnie seems insane. Keeping alive the show’s tradition of dishes named with nonsense rhymes, she calls her dish Fall to Your Knees Mac ‘n’ Cheese. “I have made this on Good Morning America!” she boasts, though it’s maybe less of a brag than she thinks. These menopausal ladies are cuckoo and it’s great. Meanwhile, Johnny Weir ignores Guy’s instructions to add fat to his chicken patties. As an ice skater, Johnny eats only fat-free foods, which pretty much guarantees everything he cooks will not taste good. His husband must love him very much. With the dinner theater seats filled with Rachael, Guy, and the visiting dignitaries of Entertainment Weekly, the show begins. It’s clear from the skits that the contestants got to spend a lot more time in the costume room than in the writing room preparing for their food-based sketch comedy. But I’m also joking; there was no writing room. There was maybe a “One Bad Idea Then Three People Nodding Room.” Team Guy transports us back to an Old West saloon, and it is so good it’s like we finally get our third season of Deadwood. In the Old West, if you didn’t know, everybody uses a Southern accent to describe the dishes they cooked, as Sheriff Dean says, “Ya see, I’m all about skirt steak.” Very Western. Chilli saunters onstage in a cowboy hat and a vest with a prop revolver, and the best part of the episode is that she absentmindedly talks into the barrel of the gun like it’s a microphone, and she looks like she is about to blow her brains out, which is not an unreasonable thing for her subconscious to want. Johnny saunters onstage in a corset and then Dean plants a long, slow, wet kiss on him. The crowd erupts, and Dean looks confused, not by the crowd but by the fizzy soda feeling Johnny has given him in the very bottom of his tummy. He’s covered in lip gloss. Cornelia says, “We have hit a home run!” like a person who has never seen a baseball game. Team Rachael does their weird Cinderella skit, which has nothing to do with food, but instead consists of Kathy Najimy saying words from Cinderella backward while Gilbert Gottfried wears a wig and a boa. (He’s very funny and adorable in it, but in the same way that a dog dressed up like an old lady is funny and adorable, but you feel a little bad because the dog doesn’t know why you are doing this to him, and what is a costume even?) Carnie and Hines are fine, but it’s Gilbert who steals the show, and that is not a surprise considering he was, as I mentioned before, Iago in Aladdin, one of the greatest films of all time. The contestants serve their food and then people from Entertainment Weekly eat their food. The judges at the table with Rachael and Guy are particularly intense. Everything the one guy says is such a tightly wound one-liner, like he was told that if he didn’t get 15 sound bites on air during his one reality show appearance his family would be buried alive at the bottom of a mine. Some of the food is not so good. Chilli’s tilapia tostada and Hines’s wings and Carnie’s mac and cheese are the best. The chicken patty with truffled honey butter is outstandingly gross. Gilbert served his grilled cinnamon peanut butter, banana, and jelly sandwich thing. While in the kitchen, he had to keep asking other people if it was burnt, because maybe he’s also blind, I’m not sure. Rachael clucks her tongue to the other judges, saying, “You don’t bring a PB&J to a potluck.” You told him to make it, Rachael. How dare you throw him under the bus? Or is that impossible because this whole show is under a bus? After tallying the votes from the writers, Rachael and Guy reveal that Team Guy won. Kathy and Gilbert, the two least successful members of Team Rachael, must face off to see who goes home; they have to cook midnight snacks. They rush back to the kitchen, and Gilbert proves he is the funniest person on the show by cooking “what he knows,” making another peanut butter and banana sandwich. He is the man. “One thing that keeps going through my mind: Uh-oh, I’m really not that good a cook.” Please put him on all the reality shows. He gussies up his sandwich with a whole strawberry on top and then cuts it into a grid of eight square pieces. It’s such a mess and I hope he automatically wins the whole show and that they cancel it after one episode. Alas, Kathy makes a very respectable-seeming hummus from her mother’s recipe, and she wins the obviously-not-blind taste test. Gilbert is going home. Everybody has only known each other for 25 minutes, so there are no tears or hugs, except from me, who would have really liked to see 10 more peanut butter sandwiches this season. Max Silvestri (@maxsilvestri) is a comedian and a writer based in New York.